This sword of William Wallace is full size. That is 55" or 140cm. The blade is made of stainless steel. and the handle is wrapped with suede. This product is brand new and comes in a box. Sir William Wallace: (Uilleam Uallas; 1272 – 23 August 1305) was a Scottish knight and landowner who is known for leading a resistance during the Wars of Scottish Independence and is today remembered as a patriot and national hero. The sword measures 1.4 meters in length and weights roughly 2kg. The cross guide is made from stainless steal and is 30cm wide. The handle and 1/4 of the way down of the blade is covered in a dark brown leather with 2 grooves running round the ends of the guide on either side. The pommel (tip of the handle) is made from stainless steel and. has small groves around the edge of it as well as a small bump on the very bottom. 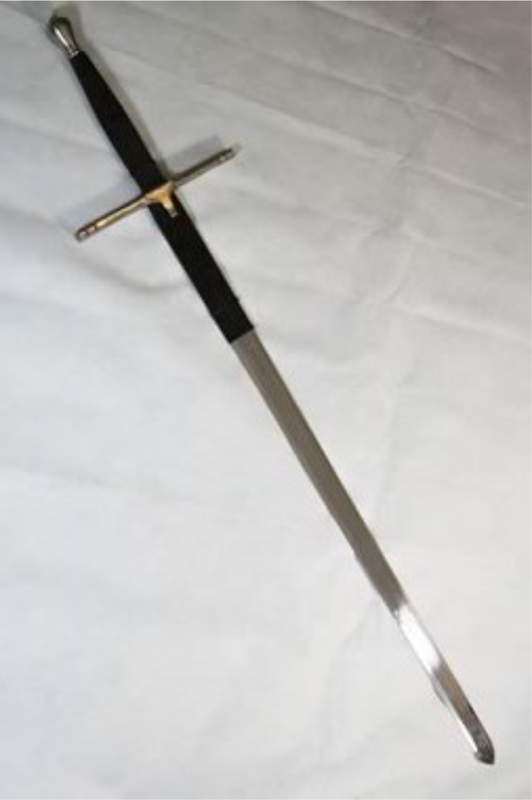 Received this Braveheart Sword looks stunning on the wall gr ..